Hip pain, one of the common symptoms patients complain of, may not always be felt precisely over the hip joint. Pain may be felt in and around the hip joint and the cause for pain is multifactorial. The exact position of your hip pain suggests the probable cause or underlying condition causing pain. Pain felt inside the hip joint or your groin area is more likely to be because of the problems within the hip joint. Likewise, the pain felt on the outer side of your hip, upper thigh or buttocks may be a result of the problems of the muscles, ligaments, tendons and soft tissues surrounding the hip joint. However certain disease conditions affecting other parts of your body such as lower back or knees may also cause hip pain. 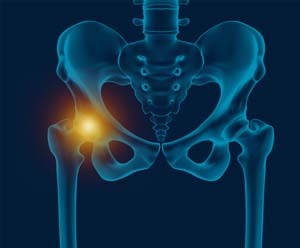 The main cause of sudden pain in the hip is an injury resulting in fracture of the hip bone. Hip fractures are common in the elderly because the bones thin out as age advances. Other causes of hip pain may be arthritis, bursitis, infection, low back pain, osteonecrosis of the hip, sprains or strains and tendinitis resulting from repetitive use. Your doctor will evaluate the condition based on the medical history, physical examination of the hip and thigh region, and diagnostic tests including X-rays and other scans.